THE GOG BLOG by RORY SPEARS, Editor and Director of Content. 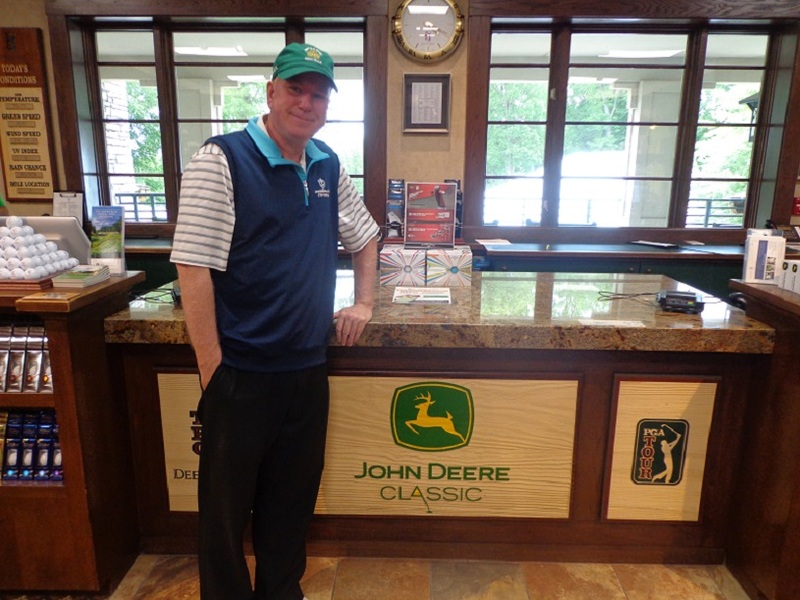 Follow Rory to the John Deere Classic, and on Facebook, Linkedin and Twitter @GogBlogGuy. Illinois tried to come from behind just one time too many, and it finally caught up with them. After a stunning rally in the morning to defeat #1 rated USC, Illinois did not have the same magic to defeat Oklahoma, losing to the Sooners 3 1/2-1 1/2 in the semi-final matches. In the morning, Illinois trailed USC early by a 4 and 1 score, but started flipping matches midway through the round. Edoardo Lipparelli won his match 1 UP over Sean Crocker, and then Giovani Tadiotto also was a 1 UP winner. Michael Feagles was coming back and Dylan Meyer rallied from three down to get A/S. But when USC’s Rico Hoey missed a five foot par putt on 18 to force extra holes with Nick Hardy, their match and the team match was over. 3 1/2 to 1 1/2. After a quick break, Illinois headed out to play Oklahoma the #2 in the match play. Lipparelli playing his final match for Illinois before turning professional after his sophomore year, fell behind quickly against Oklahoma’s Blaine Hale and went on to lose 4&3. Tadiotto trailed on the back nine 3 DN, but rallied to get to 1 DN with two holes to play, but a bad drive, led to a drop and and a bad stance that forced a poor recovery shot. When he lost the hole and the match, Illinois was basically done. Michael Feagles trailed most of his match before losing 2&1. Nick Hardy rallied to halve his match and Dylan Meyer controlled his match the entire way, but it wasn’t enough for Illinois to pull off the comeback. Oklahoma advanced to play Oregon in the championship match tomorrow afternoon. Click here to hear interviews with Illinois Coach Mike Small, Dylan Meyer, Nick Hardy, and Edoardo Lipparelli in that order. A good sized gallery of several thousand Illini fans came out to cheer on the Orange and Blue, and the Illini players said they really felt the support. For some of them they had never played in front of galleries of this size. Now for Coach Mike Small it will be time to reload not rebuild his squad for next next year. Tee times in the championship matches begin in the 2 PM hour CST, and will be show live on the Golf Channel. THE GOG BLOG by Rory Spears, Editor and Director of Content. Follow Rory to Rich Harvest Farms and on Facebook, Linkedin and Twitter @GogBlogGuy. MOVING ON! that’s what Illinois is doing and they will enter the eight team match play part of the championship as the #3 seed and will play the #6 seeded USC Trojans. 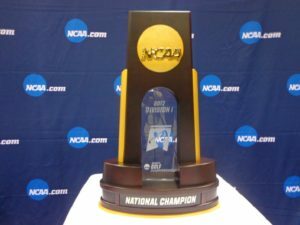 USC entered the 2017 NCAA national championships as the #1 team in the country. Illinois has been better this week at Rich Harvest Farms, but not by much. The quarterfinal match up will be the biggest game between the schools since the 2008 Rosebowl won by the Trojans. But this time Illinois gets the home field advantage. USC had former Trojan and NFL Hall of Fame player Lynn Swann in it’s gallery on Monday. Illinois was not sure if any of it’s former players and PGA Tour players could attend the match play. The Illinois match vs USC will start at 7:00 AM off the 10th tee. The match breakdown is as such. 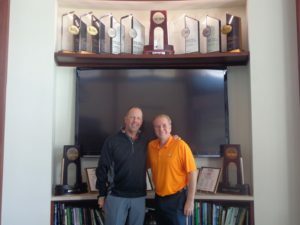 Click here to hear interviews with Illinois players Edoardo Lipparelli and Dylan Meyer, along with Coach Mike Small. Illinois got off to a good start on a windy day, but struggle mid round and saw it’s hope to advance start to slip away, Coach Small had to go get in his players faces at that time, but Meyer said it was Illinois needed at that time. Small again needed to challenge his players around the 17th hole, but Meyer answered the bell with a 20 foot putt as the last player through. The 18th hole saw freshman Michael Feagles make birdie and Lipparelli make a 30 foot eagle putt, that turned out to be important in the final scoring. Especially after Hardy missed a 5 foot birdie putt and then Meyer failed to get up and down from the front bunker and settled for bogey on 18. Braden Thornberry from Ole Miss was the individual champion, winning his seventh tournament during his time at Mississippi. The action for the rest of the tournament will be live on the Golf Channel. The semi-finals will be played mid-afternoon tomorrow, with the finals on Wednesday afternoon. Today we thank those who have served, those who have made the ultimate sacrifice, and those who are still with us and were fortunate to make it home safely. They are the reason we can enjoy the golf course today, watching the NCAA Championships at a place like Rich Harvest Farms, or just flipping burgers, steaks, chicken or ribs on the grill. That cold one we enjoy the most. It’s a day we salute those like Major Ed Pulido of Folds of Honor, and closer to home tomorrow, is the Illinois Patriot Day at Medinah Country Club lead by founder Mark Slaby whose golf outing to help our Illinois vets is among the best charity golf outings in Illinois and the Chicago area. Support those groups if you can, and if you enjoy golf, you can do it through golf, a great way to give back. BREAKING NEWS-TIGER WOODS ARRESTED FOR DUI. Some stories just write itself. Moving right along….. 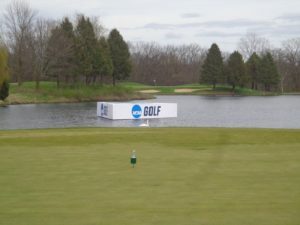 THE NCAA CHAMPIONSHIPS at Rich Harvest Farms have been a success, in spite of weather that has limited the crowds a bit. During week one the Northwestern women made a great run to the national championship match, only to come up just a little short of a national title. Now in day 4 of the men’s championship Illinois finds itself in the hunt for a title as well. Illinois Coach Mike Small has paid his dues and had several close calls in winning the title, hopefully this is that year. THE ILLINI players are making it clear that they are not at Rich Harvest for another close but no cigar trophy, they expect to win the championship this year. Why not make the trip to Rich Harvest the next few days and see if they get it done. 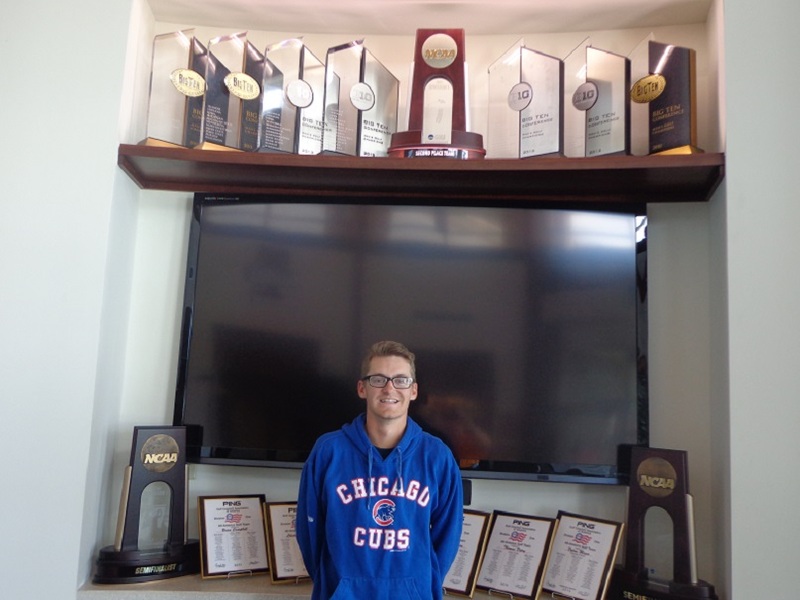 Dylan Meyer in front of the Illinois Men’s Golf hardware at the teams practice facility. 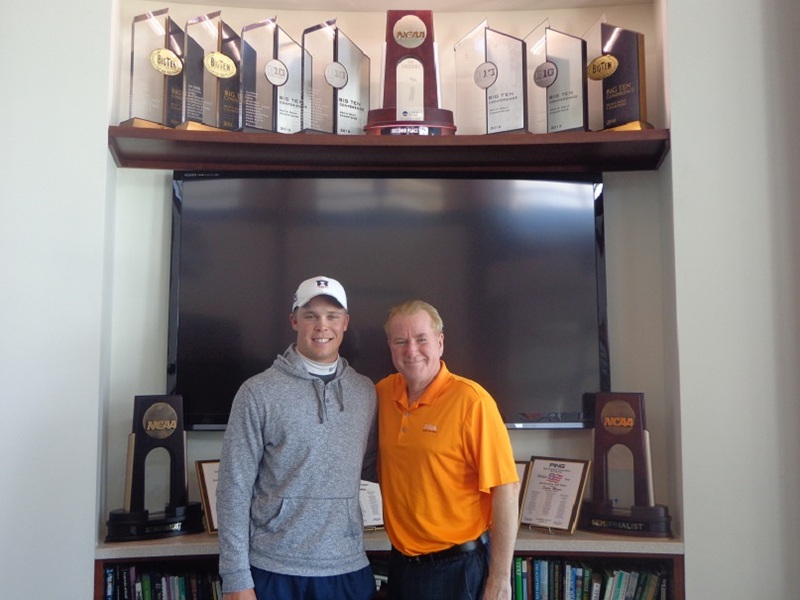 Golf fans may have heard the name Dylan Meyer, Illini golf fans sure have. The junior from Indiana has been a big part of the team, and just returned from Colonial Country Club last week, where he was one of three finalists for the Ben Hogan Award (won by Maverick Mcnealy). 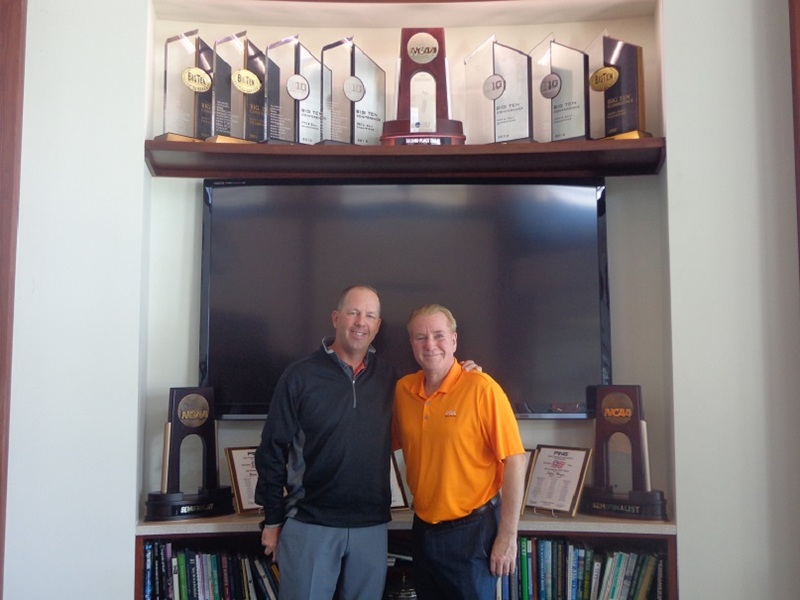 The Hogan award in college golf is like the Heisman Trophy Award in college football, yes it’s that big. After putting behind him the fact he did not win the award, the B1G Ten player of the year is moving forward with his team and trying to win a national title. 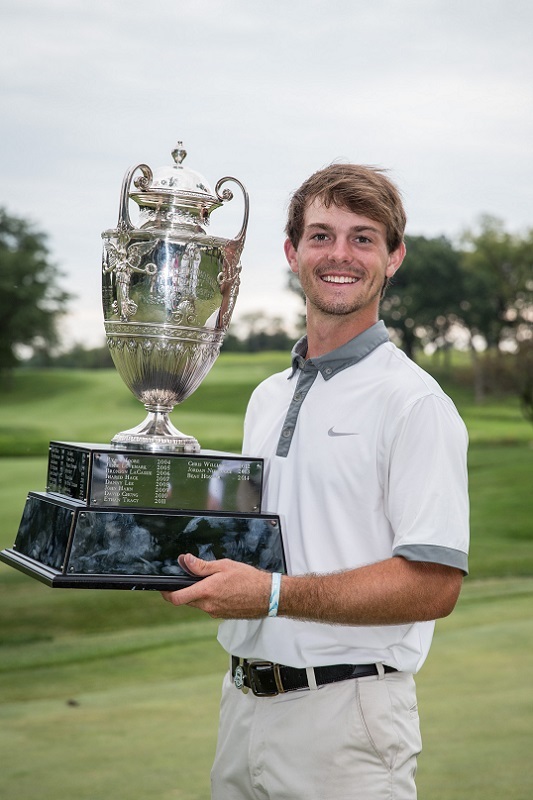 On Thursday this week he will be at the Skokie Country Club for the Western Amateur media day, since he is the defending champion after winning last year at the Knollwood Club in Lake Forest. Meyer along with his teammate Nick Hardy of Northbrook, will address the press and room full of golf VIP’s and Western Golf Association officials. But the story that has come out of national championship week is that Meyer now has a healthy issue in front of him to deal with. After spending three nights in a hospital right before regionals, Meyer was diagnosed with with Ulcerative Colitis and will now have to have treatment about every eight weeks. Perhaps for a lifetime. Hardy went to the hospital everyday to see Meyer, he brought food and other things to help Meyer. But in the end all Hardy could do was keep Meyer company through out the ordeal, at times sleeping on the front of Meyer’s hospital bed. The good news is that Meyer sits in third place in the individual part of the championship and with a great round today, could be NCAA national champion by the time the sun sets tonight. Go low Dylan, the Illini nation and a few more are all pulling for you. THE MEDIA, it’s really appalling to see the lack of media support for the NCAA Championships from the Chicago media. Yes it’s a holiday weekend, but there is no excuse when Northwestern was competing for a national championship last week and Illinois is in the hunt this week. If the Illini continue, let’s hope there is a better showing of local press as this week moves forward. 15 teams left, it will be down to eight after today. Go Illini !!!! THE GOG BLOG by Rory Spears, Editor and Director of Content. 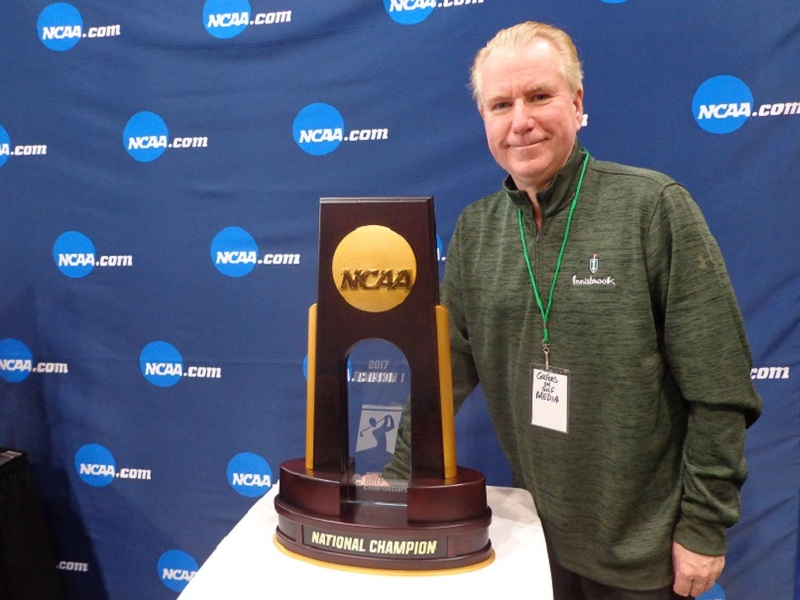 Follow Rory to the NCAA Championships and on Facebook, Linkedin and Twitter @GogBlogGuy. They are in the hunt again, the men’s Illinois golf team that is. The Illini are sitting in in 5th fifth place, 4 shots behind leader Vanderbilt. While there is no blame for Illinois being in fourth place, Junior Nick Hardy put it on himself for a triple bogey 8 on 18, after playing 17 good holes. The triple bogey left him a 3 over par 75 score, and Illinois not far behind. Teammates Dylan Meyer and Edoardo Lipparelli seeing Hardy in trouble, both made birdies behind him to help the sting of Hardy’s score. Hardy said he knew he had 290 yards to the slope in the 18th fairway, playing into the wind he hammered his driver, but the ball still carried the ridge on the hill, and rolled halfway down the steep slope and ended up on the NCAA logo. Just trying to put his ball in play with a wedge, he skulled the ball into the weeds surrounding the creek. He did find the ball and could only hack it out a few yards. But his 4th shot to the green saw his ball covered in mud, fly the green and into the gallery. From there he pitched onto the green and then three putted. Not the way he expected to finish. Regardless of how the entire Illinois story finishes out this week, Dylan Meyer is one heck of a gutsy player. At one point on Sunday Meyer lead the individual standings. When the day finished, he was T-2 three shots behind Scottie Scheffler of Texas. But that doesn’t begin to tell the Meyer story. Illinois golf fans were surprised when Meyer playing back in his home state of Indiana didn’t play well at the regionals. Now we know why. It’s hard to prepare from a hospital bed where Meyer spent three days. Meyer who have never spent a night in a hospital before was diagnosed with ulcerative colitis, an inflammation of the large intestine. Something he will have to deal with every eight weeks, maybe for the rest of his life. Hardy went to the hospital every day, and tried to bring Meyer food and other things, but Meyer couldn’t eat. So Hardy just snuggled up at the foot of Meyer’s bed and let his teammate know he was there for him. When Meyer returned to practice, the first day back he was the last to leave, something that doesn’t happen often. That got Coach Mike Small’s attention, who sat down with Meyer and simply told him that he could sulk about his situation or go back out and start making birdies. Meyer decided that birdies was the option he liked. He finished round 3 with a three under par 69, and after a pushed approach on 18, and a weak chip that left him a long 25 foot birdie putt. Meyer stepped up and drained it dead center and a large pro-Illini gallery on 18 erupted, including Illinois alum and PGA Tour player D.A. Points who was standing with the team. Meyers smile and fist pump said it all. Now he enters the last day of stroke play with a chance with a chance to win. 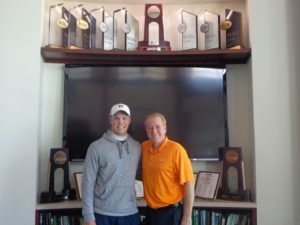 Click here to hear interviews with Illini Dylan Meyer, Edoardo Lipparelli, Nick Hardy and Coach Mike Small. 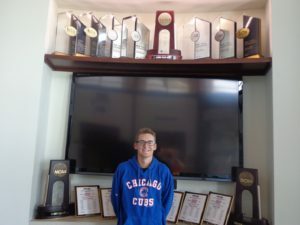 Lipparelli a sophomore also announced that the NCAA Championships would be his last amateur event, as he is turning professional this coming week, and will forgo his last two years of eligibility at Illinois. Illinois will advance and play in the final day of stroke play on Monday with 14 other schools. With the first 36 holes in the book the University of Neveda Las Vegas (UNLV) holds a 1 shot lead over the Sooner of Oklahoma, with Illinois in third place just three shots back. Day 2 of the men’s championship had warmer weather and sunshine for a change, but for the most part it didn’t improve scores across the board. Scottie Scheffler of Texas did shoot his second straight 4 under par 68 and sits a top the individual leader board with a 136 score. Scheffler’s score only left the Longhorns in 12th place. Big 12 Player of the Year Doug Ghim of Arlington Heights bounced back on Saturday with a 2 under par 70, after opening with a +5 77 score. Playing as an individual Trent Wallace from Joliet who attends Illinois State University carded an even par round of 72, and sits at +1 (145). FOR ILLINOIS, it was Dylan Meyer back in the saddle again after a sluggish regional. Meyer shot a 5 under par 67 that carried Illinois on day 2. Freshman Michael Feagles who had a 3 under par 69 in round one, had a four over par 76 (145 +1) for round 2. With with Meyer on the move and Nick Hardy grinding but at one under par, Illinois found it self in the hunt sitting just three shots back in third place. Oklahoma that had a great team round going on day day two, fell back with two of it’s players played the tricky par 4, 17th hole in a combined 7 over par. Oklahoma is in second place between UNLV and Illinois. After Sunday’s round three there will be the first cut, that shortens the field from 30 teams to the top 15 and ties. On Monday the second cut will fall and the field will be reduced to just eight teams to start the match play. The Golf Channel’s live coverage starts on Monday, but will include of the match play format. There will be Elite 8 and Final Four play on Tuesday, with the championship match on Wednesday. The Gog Blog returns to RHF on Sunday for more coverage. ILLINOIS is-3 and in a four way tie for 5th place. Michael Feagles leads Illinois at -4 through 14 holes. Different week and it’s the same story,one week after the Women’s NCAA Championship started in the rain, the men rained in the very same problem. The morning groups got finished, some of the afternoon groups were not so lucky. Those afternoon groups that did not finish included Illinois and Texas with Arlington Heights native Doug Ghim. Joliet native and Illinois State Redbird Trent Wallace, who won the Missouri Valley title got off to a bad start being four over par through five holes. But in spite of a few more mistakes, Wallace rallied to a 1 over par 73 finish. 2015 Western Amateur championship winner Dawson Armstrong of Lipscomb College, who holed a miracle bunker shot to win at Rich Harvest Farms, rallied to shot a 1 under par 71. While on the clock on 18, and needing to finish the last hole in 8 minutes (he played it in 5) stiffed a wedge to 6 inches to make birdie and end his round. 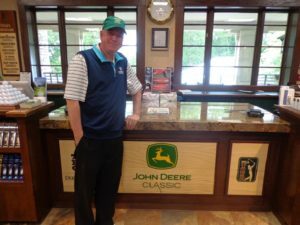 Armstrong noted that just about any championship could be played at Rich Harvest Farms including a PGA or a Ryder Cup., saying the course can be set up real hard, or turned into a birdie fest. Illinois had an adventure having to start and stop because of the rain delays that lead to an incomplete round, stopped at 8:10 because of darkness. the Illini have to restart round 1 at 6:30 AM and will get a 3:30 Am wake up call to be back on time. Click here to hear interviews with Illinois Coach Mike Small and Junior Nick Hardy. Vanderbilt leads at 8 under par with it’s players on holes 15-18. Auburn is -6 and in the clubhouse. Oklahoma State is third at -5 with players on holes 15-18. #1 USC is 4th at -4 with players on holes 15-18. Illinois sits in a four-way tie for 5th place with players on holes 11-14. Feagles has completed 14 holes. Illinois tee times for round 2 run from 8:10 with Feagles out first, and Hardy out last at 8:54. THE GOG BLOG by RORY SPEARS, Editor and Director of Content, follow Rory on Facebook, Linkedin and Twitter @GogBlogGuy. 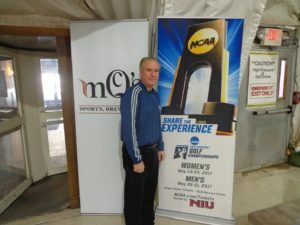 Go to the NCAA Championships at Rich Harvest Farms. 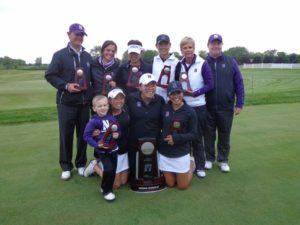 What a run, it came to an end at the end of the season, but Northwestern’s Women’s golf team gave it all they had, but came up a few made putts short in a 3 1/2 to 1 1/2 loss to Arizona State in the championship match. But give the Wildcats credit, they earned the #1 seed in match play, the held off a scrappy Kent State team in the quarterfinals. Then they rallied in dramatic fashion to come from behind to defeat USC 3-2, and then as the fans wearing purple poured in they gave it all they had against the top ranked Sun-Devils of Arizona State. Arizona State won it’s eighth NCAA women’s title an NCAA record. But it’s first since 2009. Northwesterns Players and Coach’s gather around the NCAA National Runner Up trophy on a practice tee at Rich Harvest Farms. 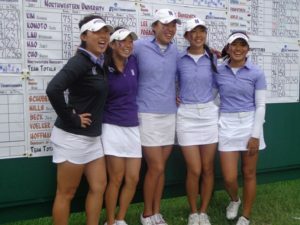 It was as close as Northwestern had been to a national title in years, and when the word came down to the athletic department that it’s women’s golf team had pulled off a miracle rally vs USC to advance to the finals. The universities athletic director Jim Phillips ordered the sports department closed for the remainder of the day, and ordered everyone to Sugar Grove to help bring the ladies home with a title in hand. Within an hour a sea of purple was seen speeding down Rt.88 headed for Rich Harvest Farms. 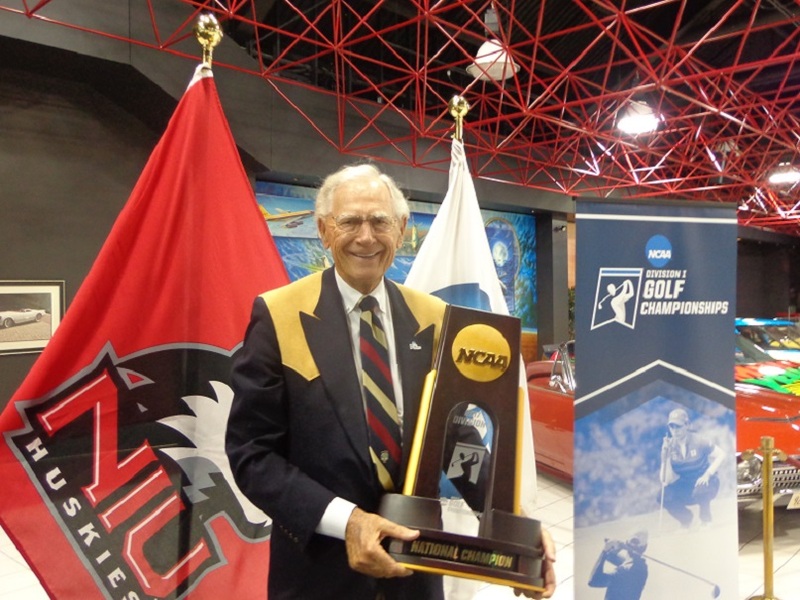 The students, the alumni and golf fans in general were on their way, hoping that NU was on it’s way as well. Click here to hear interviews with NU’s Janet Mao, Coach Emily Fletcher, and Arizona States Monica Vaughn and NCAA 2017 Women’s National Champion. The matches started out close with Arizona State taking the early lead, then a few matches flipped towards Northwestern’s way and the Wildcats briefly had a lead. But that didn’t last. Arizona States Olivia Mehaffey soon took control of her match and set the tone by defeating Sarah Cho 4&3. Individual champion Vaughn went back and forth with NU’s Hannah Kim, but when Kim drained a 30 foot bomb on 17 she was 1 UP with one to play. Vaughn playing the champion she is birdied 18 to force the 19th hole. After both players tee’s off on 19, they were in the middle of the walking bridge to the first fairway when the match was decided and there match ended A/S. The Arizona State Sun Devils celebrate with the national championship trophy. For Northwestern one bright spot in the championship matches was Sr. Kacie Komoto ending her NU career with a win over Sophia Zeeb by a 3&1 score. But Roberta Liti defeated NU’s Janet Mao 5&4 and Linnea Strom was a 5&3 winner over Stephanie Mao and those two matches gave ASU the crown. If you were on property at Rich Harvest Farms during the title match, there was plenty of cheers that could be heard rolling through the grounds. If you were watching on The Golf Channel there was plenty drama to see. In fact so much even Coach Fletcher was anxious to get home and watch a replay of the match her team just lost. 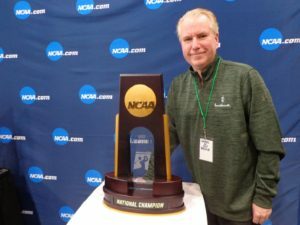 While it would have been a rare national championship for Chicago’s Big Ten Team, and for a moment it looked like the Chicago area would get a college title in it’s own back yard. It just wasn’t to be. Coach Emily Fletcher will have 4 starters back and a few new good recruits. In the meantime winning a title at Rich Harvest Farms in 2017 now falls on the shoulders of the men from Illinois. That journey starts tomorrow. They won, or did they. That’s the feeling right now for the Purple of Northwestern. Yes they won the stroke play part of the NCAA Women’s Golf Championship for 2017, now it gets tougher as the match play part of the championship gets underway this morning. For the first two days of the championship the battle was between Northwestern and Kent State. But Kent State fell back to the 8th seed, and NU is the #1 seed, so they get to go head-to-head in the quarterfinals. Winner advances to the final four, loser goes home. The Northwestern ladies celebrate a win, but their work is only halfway done. With a three day total of 897, NU defeated Stanford by 8 shots to win the stroke play title and earn the top seed. The other schools in the elite 8 are Arizona State and Florida, Stanford and Baylor, Ohio State and USC. Those are the other pairing for the quarterfinals. Arizona States Monica Vaughn was the individual stroke play champion. It seemed like Jennifer Kupcho had the championship won. Sailing along and on the 17th hole with a two shot lead, Kupcho’s approach found the water, toss in a three putt and Kupcho makes a seven. Now she is one shot down with one to play. Both Kupcho and Vaughn make pars on 18 and 9, so Kupcho ends up with the heartbreaking 1 shot loss. 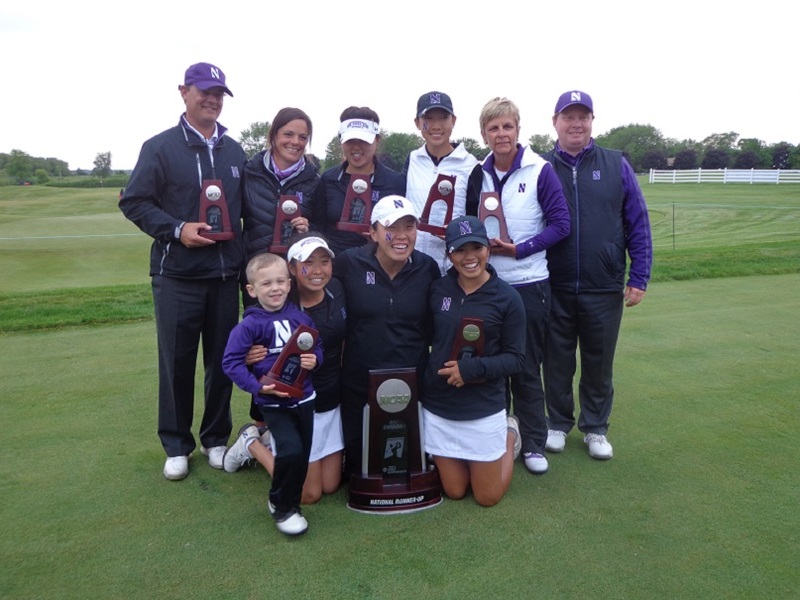 Click here to hear the interview with Northwestern’s Women’s Golf Coach Emily Fletcher. The NU coach is extremely happy with her team, a team Fletcher said at the beginning of the year she felt was #1, having all her players back. Fletcher said she would put them up against any team, but over the year her team failed to get all five players going strong together. This week has been a different story, as contributions have NU right where they want to be headed into the match play. 7:50 NU Sarah Cho-Kent St. Kelly Nielsen 8:00 NU Kacie Komoto-Kent St. Michaela Finn 8:10 NU Hannah Kim-Kent State Wad Phaewchiplee 8:20 NU Janet Mao-Kent State Karoline Stormo 8:30 NU Stephanie Lau-Kent State Pimnipa Panthong. The semi-finals or Final Four tee off at 1:30. NCAA.com/tickets, see all the action. 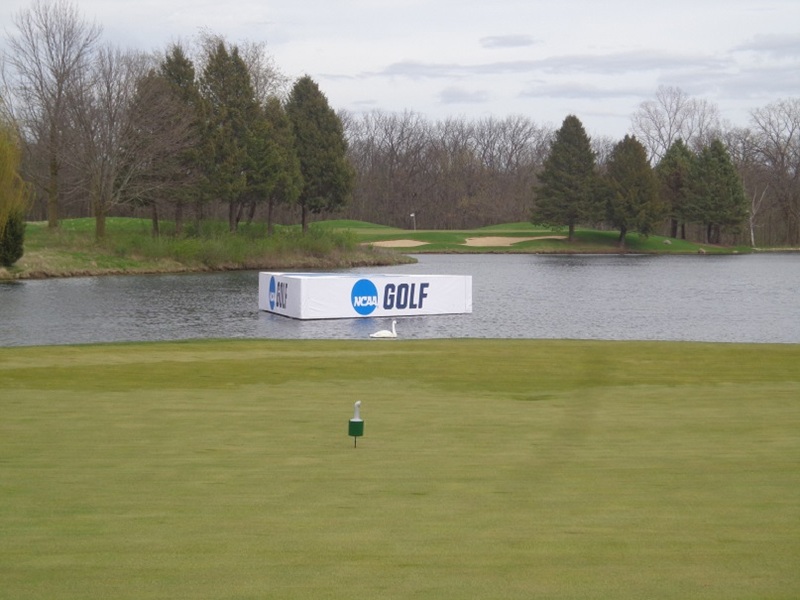 NORTHWESTERN expanded it’s lead on day 2 of the Women’s NCAA National Championships at Rich Harvest Farms. What was a two shot lead after 18 holes in 8 shots after 36 holes. On a day where the weather was not bad early, the temperatures did drop in the afternoon when the wind picked up. By the time that was happening, the Northwestern Wildcats were almost done with their round, and safely in the clubhouse. 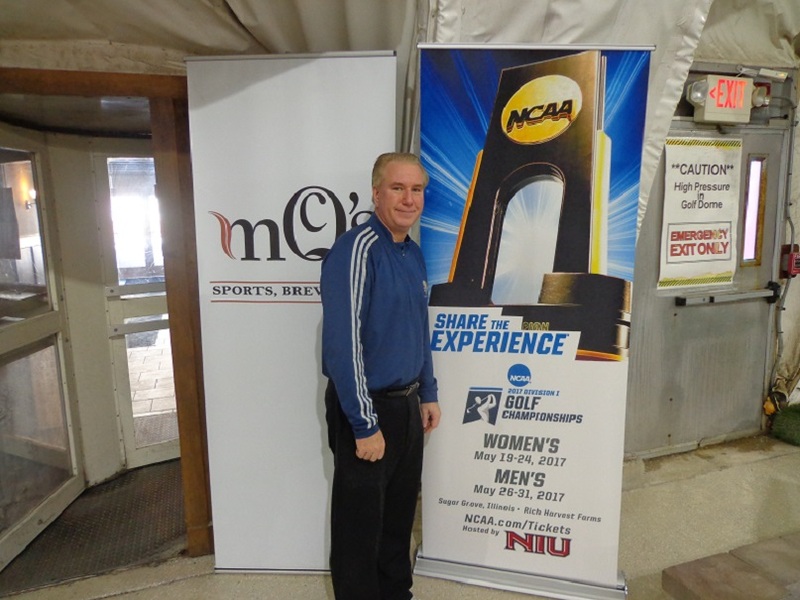 There is no doubt that NU has played in the better half of the draw both days, but at the same time the entire team has played solid golf from top to bottom. What was interesting was that both Sarah Cho of NU, and a Kent State player were both penalized two-shots for accepting a cart ride to the ladies room. While the rules do clearly state no cart rides during the round except for injury W/D, or threatening conditions, when there are no toilets close to the hole the players are playing, and round pace is running six hours, there needs to be a review of this rule. Northwestern at 599 after two days, and at 23 over par for the championship, is eight shots better than Kent State which is at 607. Stanford is in third place at 609. 10 shots back. The Wildcats were paced by Kacie Komoto the Sr. from Hawaii who shot an even par round of 72, Cho was in originally at 1 over par 73, that became a 75 with the penalty. Komoto told Golfers on Golf she had only one birdie as her birdie putts were not falling, but all of her par putts were dropping. Click here to hear the interview with Northwestern Women’s head coach Emily Fletcher. While Coaches normally look for good spring weather to get good practice in, both Coach Fletcher and her players admit they didn’t have many days this spring to practice in good weather, and that seems to be paying off. Tomorrow morning the final round will be gin at 7:45 but it will 12:40 before Northwestern’s players start their rounds off the first tee box. The Golf Channel will start broadcasting at 2 PM with a Preround show. Live coverage of third and final round of stroke play will be shown from 3-7 PM, with a post round wrap up after that. Jennifer Kupcho of Wake Forest university shot a 2 under par score of 70 in round 2, to be the individual leader. She is at even par for 36 holes. THE GOG BLOG by RORY SPEARS, Editor and Director of Content. 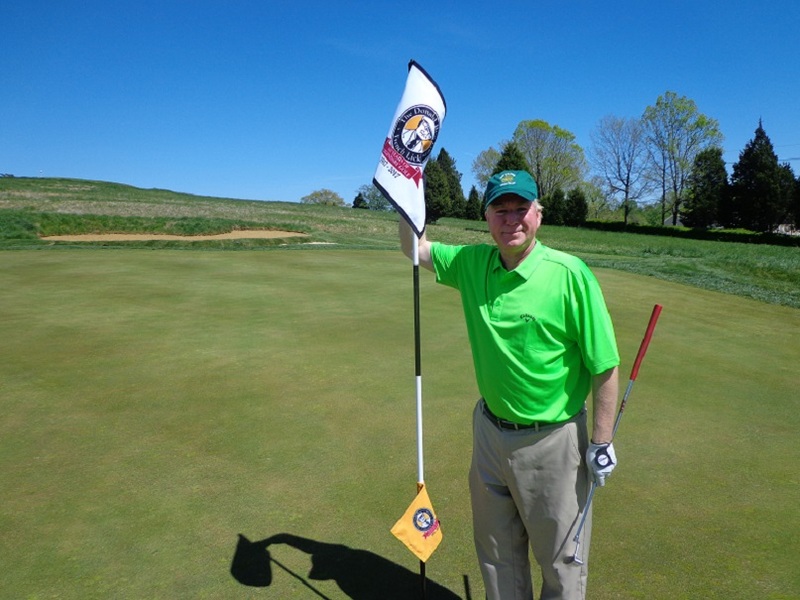 Follow Rory on Facebook, Linkedin and Twitter @GogBlogGuy and to the Donald Ross Course at French Lick Resort in it’s Centennial year Happy 100. Second Round play of the Women’s NCAA national Championship’s was cancelled on Saturday due to rainy weather. Play resumes on Sunday morning at 7:30 AM with Saturday’s original tee times and pairings. All 24 teams and the 12 individual players will compete on Monday. Pairings for Monday will be determined by the teams 36 hole scores. The medalist will be decided after 54 holes (instead of 72). The cut will be made after 54 holes and the field will go 8 teams for match play on Tuesday. Tuesday will see the quarter finals in the morning, and the national semi-finals in the afternoon, which will be shown on The Golf Channel. 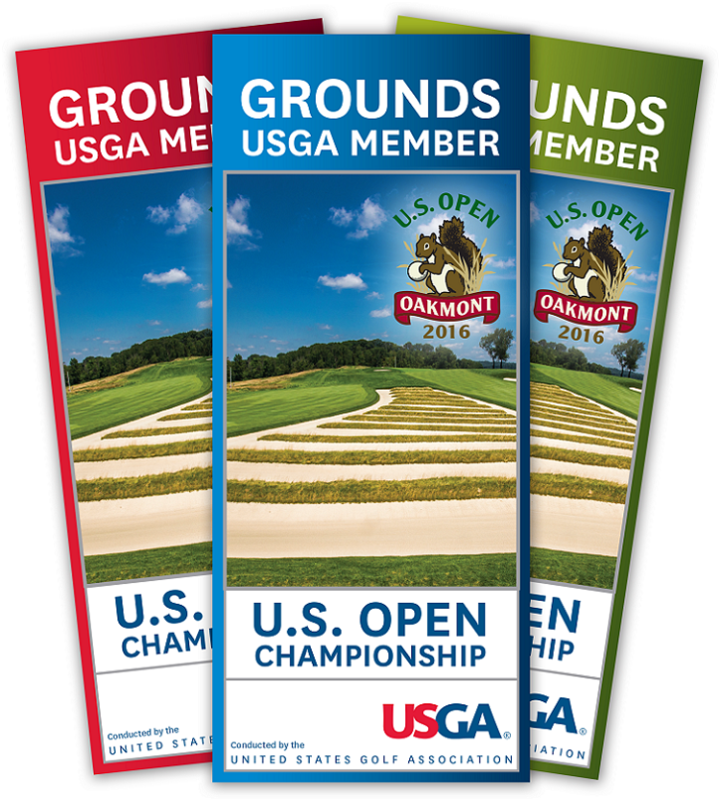 TGC will have 30 hours of coverage during the championships. The national championship match will tee off on Wednesday afternoon. Results and pairings can be found at ncaa.com/d1-w-golf-leaderboard-2017. Or at Golfstat.com. 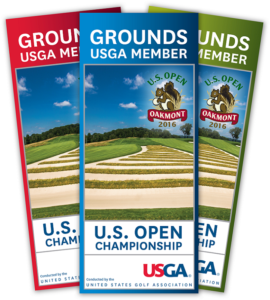 Golfersongolf.com will have daily coverage of the championships. Northwestern University is leading the championship by 2 shots over Kent State University after the first 18 holes, that were completed on Friday.